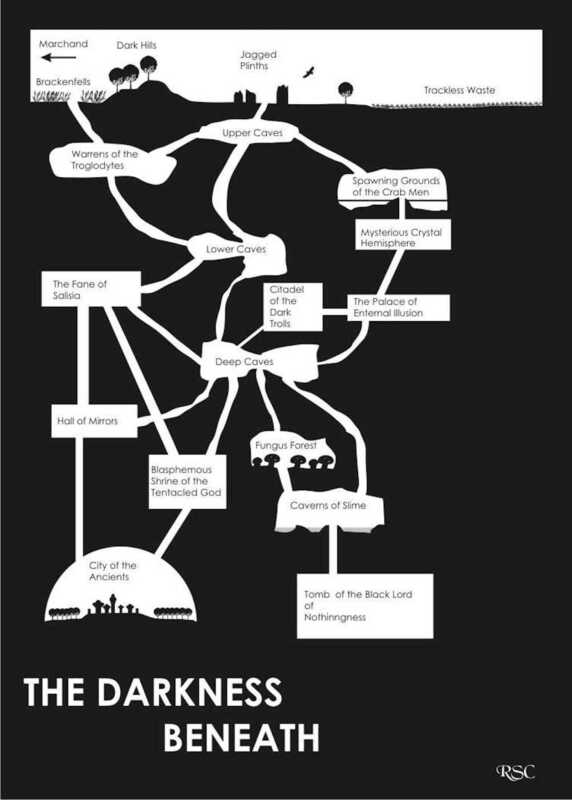 The Darkness Beneath, published in serial form in the magazine Fight On! There has been some interesting blogging on megadungeons, recently. Yesterday, Wayne Rossi at Semper Iniativus Unum asked, Why Build a Megadungeon in 2017? Peter V. Dell'Orto at Dungeon Fantastic followed it up with More Thoughts on Megadungeons, and then Rossi posted Megadungeons, Bosses and Goals, today. Both authors have written many great posts on the subject over the years. 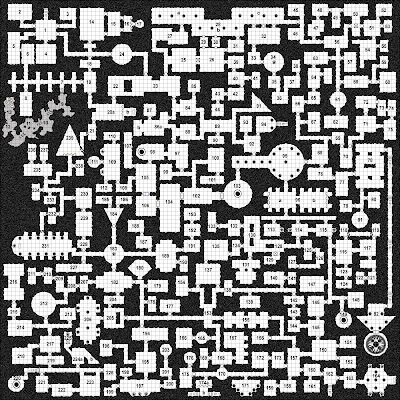 Dell'Orto has a useful page on his site that compiles his posts, as well as directing the reader to a more general compilation of megadungeon resources at Ken "Rusty" H's The Rusty Battle Axe. David Hartlage at DmDavid has compiled a useful list of published megadungeons (as of late 2015), here. Rossi and Dell-Orto make a number of helpful and interesting points, but the most memorable part of the exchange is Rossi's claim that to him, using a megadungeon that you didn't design yourself is like wearing someone else's pants to your own wedding. This is one of those times where even though personal preference is obviously important, there's room for a bit of objective analysis and persuasion. I still have no problem running Stonehell or contemplating running Barrowmaze or whatever, but I admit that Rossi pushed me a bit more into thinking about going back to my own dungeon projects. The exchange also prompted me to reread Jason Cone's short section on "The Dungeon as Mythic Underworld" in his seminal Philotomy's Musings, A collection of interpretations, house rulings, expansions, and general pontification on the nature of the Original Dungeons & Dragons rules by Gary Gygax and Dave Arneson. Many, if not most of you are no doubt familiar with this 49-page PDF. If you're not, you're in for a treat. It's one of the main resources that got me excited about coming back into the hobby a few years ago, as well as making me consider or reconsider OD&D (as opposed to, say, AD&D). Cone (AKA Philotomy) argues that the dungeon or megadungeon may be usefully thought of as more than just a big hole in the ground with levels, monsters and treasures. Rather, it may be a "mythic" world of its own, possibly even subject to its own rules or laws. Thus, one need not be embarrassed or feel like one has to completely justify or explain the dungeon's contrived seeming elements by coming up with a completely coherent dungeon "ecology" or whatever. That weird things happen - all dungeon inhabitants can see in the dark (until they join your party), doors shut mysteriously and so on - may be a feature not a bug. I'm not putting it very well. As you'll see, below, Cone is much more articulate and persuasive. I don't think Cone is arguing that a dungeon should be a completely random "funhouse," but he makes a good case that something a bit more than a totally "naturalistic" interpretation may sometimes be satisfying. This conception goes back to OD&D and its vibe. But, of course, there's no reason why one couldn't adapt it to AD&D or even 5e mechanics. I've taken the liberty of excerpting the entire section. If you don't have a copy of the PDF of Musings, you can download a free version here, in a nice-looking OD&D style layout put together by Jason Vey. Greg Gorgonmilk also "recovered" it here. In other places in the Musings, Cone has a funny style. "Considering OD&D?" he titles one section, as if he's innocuously handing you a religious pamphlet or asking you to try a new drug you might have heard about. "Well, here's what you should know," he could have added. And then there's the way he ends his discourse on the mythic dungeon, a place where you may end up alone in the dark, wondering why your monstrous pursuers always have such an easy time opening those doors: "And boy, is it fun." Notice that all characters, including those which can see in normal darkness (e.g. elves, dwarves), require a light source in the underworld, while all denizens of the place possess infravision or the ability to see in total darkness. Even more telling, a monster that enters the service of a character loses this special vision. Similarly, characters must force their way through doors and have difficulty keeping them open; however, these same doors automatically open for monsters. This is a clear example of how the normal rules do not apply to the underworld, and how the underworld, itself, works against the characters exploring it. Of course, none of this demands that every dungeon need be a mythic underworld; there could be natural caves and delved dungeon sites that are not in the "underworld" category, and follow more natural laws. Nevertheless, the central dungeon of the campaign benefits from the strange other-worldliness that characterizes a mythic underworld. There are many ways to move up and down through the levels. If you embrace these concepts, you'll be playing OD&D according to some of the original assumptions of the game. And boy, is it fun. 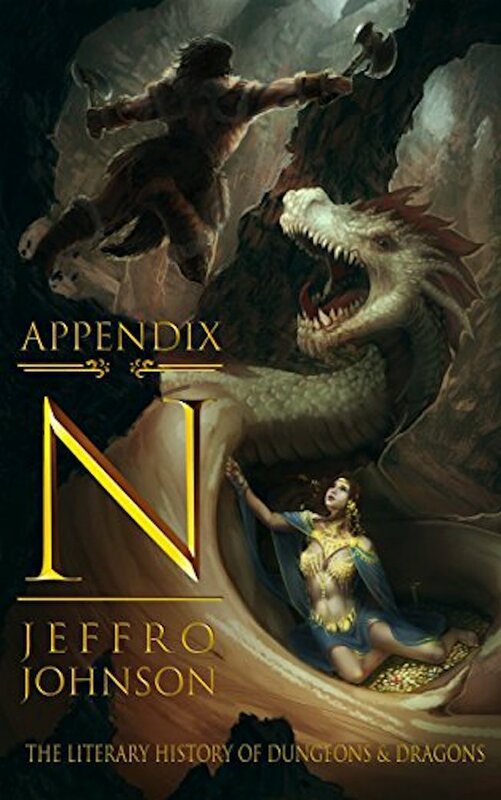 I'm midway through reading Jeffro Johnson's Appendix N: a Literary History of Dungeons & Dragons, published by Castalia House. I'm going slowly and it's been a sort of surreal experience for reasons having nothing to do with the book itself. Rather, since Appendix N is not yet available in hard copy, and since I do not own a Kindle or tablet, I'm reading it entirely on my iPhone - a first for me. And for reasons of pride or habit or whatever, that means I'm reading it exclusively on busy train rides. It's sort of an experiment. I'll probably reread it quickly on my desk computer. If you haven't read Appendix N but you've heard a bit about it, I wonder what you think it is. I had thought it would be more of a straight literary analysis of books that Gygax and others claimed had influenced D&D, which would of course have been fine. But in fact there are many more references and discussions of gaming than I anticipated, which is more than fine. It's interesting to compare it to the discussions of the relevant fantasy literature in Jon Peterson's Playing at the World. A bit of the same ground is covered, but of course Johnson has the space to go into much more detail, as well as marching into new and interesting territory - he does a lot more than look at alignments or the Vancian origins of magic, etc. Just to take one example, there's a neat discussion of how Vance's Dying Earth setting was perhaps at least part of the inspiration for the random encounter tables on Castles in The Underworld & Wilderness Adventures - inspiration that was largely overlooked or forgotten, as well as becoming somewhat of a lost opportunity as the game developed. Peterson was the neutral historian, a stance that was precisely appropriate for his task. I've read his 698 page book twice and think it's clearly the book of record on the overall historical topic, as well as being endlessly fascinating. But I can see how some (who might have a mild aversion to long history books or whatever) might call it "dry." Johnson's Appendix N is anything but, partly because the genre of Appendix N (it was for a while - still is? - number one in the Criticism and Theory category on Amazon) allows for and requires more in the way of opinions - an area in which Johnson does not disappoint - but also because, unlike the historian, Peterson, Johnson is writing as an active gamer, in part for active gamers. So, for example, in the middle of a discussion of L. Sprague de Camp's Lest Darkness Fall - a book that I inexplicably didn't like twenty-five years ago, but that I am now convinced I must read again - there's an out of the blue (or so it first seemed) detailed discussion of how to run a good "domain game" in Dungeons & Dragons. Of course, the discussion makes sense in the context of de Camp's book. High-level player-characters run by 21st century players are in somewhat the same position as the time-traveling 20th century protagonist of Darkness. But it was still a delightful surprise. Johnson also incorporates some input from current game bloggers, as well as including in his appendix, reviews of three game products as well as a fascinating interview with Tunnels & Trolls designer Ken St. Andre. A half dozen authors would have easily been considered on par with Tolkien in the seventies . . . Entire genres have been all but eliminated. The majority of the Appendix N list falls under either planetary romance, science fantasy, or weird fiction. Most people’s readings of AD&D and OD&D are done without a familiarity of these genres. Science fiction and fantasy were much more related up through the seventies. Several Appendix N authors did top notch work in both genres. Some did work that could be classified as neither. It used to be normal for science fiction and fantasy fans to read books that were published between 1910 and 1977. There was a sense of canon in the seventies that has since been obliterated. Modern fandom is now divorced from its past in a way that would be completely alien to game designers in the seventies. They had no problem synthesizing elements from classics, grandmasters of the thirties, and new wave authors. Full review to follow, but if anyone who hasn't purchased or read it yet, wants to jump on board now, you won't be disappointed. *Dungeon map by Tim Hartin at Paratime Design. The blogger, Raging Owlbear (Marty Walser), wrote two critical comments on a post I wrote a few days ago, Why Do Players Enjoy Being Puppets? I told him I would respond to them in another post. Owlbear has a great blog that I have read with interest and enjoyment. It seems like we might disagree on a few things, which is, of course, fine. This post is simply a response to his comments and questions. It's not about having the last word, or anything like that. The reason I will largely frame this current post around some of Owlbear's actual comments is not to be snarky or last-wordish, but because I'm too lazy to compose a structure for this post from scratch. Keep in mind that Owlbear typed his comments (the ones I will be excerpting in this post) quickly on an iPhone, whereas I'm at a computer, sitting back with a cigar and a drink and a thesaurus and all the rest. By the way, I'm basically incapable of writing more than three sentences on an iPhone. As I noted, this railroad adventure style has nothing to do with whether you are playing "old school" or "new school". It is an issue specific to adventure design when writing a campaign-length module, regardless of which version of D&D you are playing. So, stated simply, do you agree or disagree with that assertion? Let me try to answer that, as well as responding to some of the other comments. On old school vs. new school, one thing that OSR people often do is to draw a chronological line somewhere, say at edition 3.5 or whatever, to separate the two. But virtually everyone agrees that if the categories are meaningful, then there are "new school" elements before that line, and "old school" elements after. Indeed, old school people such as I, often argue that the seeds, so to speak, of various new school developments were present from almost the very beginning of D&D (long before any quasi-arbitrary line) and developed gradually from there. So, for example, I would point to Greyhawk (1975) - published barely a year after the three little brown books (1974) - as the origin of such new schooly things as skills and hit point inflation. (Indeed, the thief and thief skills predate Greyhawk.) That probably makes me and those like me sound like reactionaries saying that 2017 problems really stem from the French Revolution or the Enlightenment or whatever. But there it is. New things don't just suddenly spring up. And it's not silly or contradictory to argue that a new thing might have been present, in embryonic stage, right beside an old thing. It happens. But note, I (and, I assume most other OSR types) are not condemning Greyhawk or, say, 1e AD&D or 2e AD&D as horrible games or horrible heresies or whatever when compared to the "pure" original edition of D&D (first printing, of course). We're just, among other things, making the, I assume, non-controversial point that historical developments in game design happen gradually and often in an unintended and unforeseen way, unnoticed at the time. But chronology does matter to some extent, otherwise the words "old" and "new" would have no meaning. The focus of Raging Owlbear's comments was the question of whether old school or new school adventures were railroady vs. sandboxy, etc. One of the problems with discussing this is that many of the terms seem loaded - Who wants to be railroaded or manipulated as a puppet? Let's all play in a sandbox together, yay! - so let me try to choose terms that are as neutral as possible. How about unplanned vs planned? Here is an unplanned adventure, Palace of the Vampire Queen (1976), the first published (and not by TSR) adventure in D&D history. It consisted of five dungeon levels with a room key detailing monsters and treasure. That was pretty much it. True, there was a very short introduction and back story, but I'm not sure it was that important. The idea was: here is a dungeon, go and explore it. There was no preplanned plot or path, desired or anticipated. 8. Iymrith: The group gets the artifacts and returns to the oracle. They learn that they need a conch. On the way out, Iymrith attacks and Harshnag makes a heroic sacrifice. 9. Find the Conch: In the book, every giant lord has a conch. The heroes will need to go steal a conch from a giant lord. I liked a lot of these areas, so in my version I changed things a little so I can use Svardborg, Ironslag and the Cloud Giant castle in my campaign. 10. Use the Conch: It takes the group to Maelstrom (page 201). There, the heroes hopefully expose Iymrith and get a clue to Hekaton's whereabouts. 11. King Hekaton: The group tracks down Hekaton and saves him! 12. Final Battle: The adventurers team up with Hekaton to take down Iymrith. If Owlbear wants to argue that one could run Storm King's Thunder in a more open or unplanned way, perhaps by changing some things around, I'm not going to try to refute that. I'm just going by how it is usually presented, and how it seems to have been originally designed and written. You are cherry picking your examples to somehow show that "old school" D&D is better, but it's a false premise. But I think contemporary D&D would be more fun, or at least more fun for many people, if it went back to its original, yes, Gygaxian conception, where player agency was emphasized more - less Storm King's Thunder and more Keep on the Boderlands or In Search of the Unknown. Well, sure I was cherry-picking. I was contrasting planned vs. unplanned adventures. But Keep and Search (unplanned) happen to be the first Dungeons & Dragons - as opposed to the chronologically later Advanced Dungeons & Dragons many of whose first published adventures were designed as tournament modules - adventures ever separately published by TSR, and Thunder (planned) is one of the most recent. I could have emphasized the chronological point even better by going back further and citing the first non-published, non-separately published or non-TSR adventures: Dave Arneson's Blackmoor, Gary Gygax's Greyhawk , Arneson's "Temple of the Frog" in the Blackmoor supplement (1975) and of course the first Judges Guild published adventures (which all predate the TSR efforts) - City State of the Invincible Overlord (1976), Tegel Manor, Wilderlands of High Fantasy and "Night of the Walking Wet" (1977), among others. All of these were unplanned. One could also look at the sample dungeons in, say, The Underworld and Wilderness Adventures (1974), the "Holmes" version of D&D (1977) or even the AD&D Dungeon Master's Guide (1979). All of these were unplanned. And note, this is not about good vs. bad. Most people, even sympathetic OSR people, seem to think that Temple of the Frog is virtually unplayable. And, for better or worse, I'm sure most current players would regard Palace of the Vampire Queen as a sort of crude and childish joke compared to the long and detailed Storm King's Thunder. Any long running adventure module is going to have rails because one can't anticipate the actions of the players completely. This was just as true in AD&D as it is today. I honestly have no idea what this means. Why must you have rails just because you can't anticipate the actions of players (and if you can anticipate them, who needs rails)? Why not just not have rails? Or, in other words, why not just create places for them to explore and then react to that as needed? Why can't you simply have, say, a dungeon with stuff in it? Designers must write several pre-plotted scenarios for the players to run through because it is impossible to write an open world pre-published adventure. Well, actually, Wilderlands and many current OSR efforts, such as Rob Conley's The Majestic Wilderlands (2009), are exactly that - "open world" pre-published campaigns, if by "open world" Owlbear means wilderness settings. But, more to the point, there's no reason why "open" (in the sense of unplanned) has any necessary connection to the outdoors. What about just a big dungeon with no preplanned plot? Look at "Night Below" written for AD&D. It takes characters from 1st to 14th level culminating in a boss fight with aboleths. Are you claiming it somehow gave more control to players than Storm King's Thunder does? No (or, I assume, no - I haven't actually read Night Below) But, among other things, Night Below was a 2e AD&D module written in 1995, twenty-one years after year zero. It's hardly evidence for the presence of, say, a planning element in chronologically early old school adventures. Q: If you claim old school D&D gives more player agency, how are series modules like A1 - A4 (Slaver series) or Night Below, or any other longer campaign path written for AD&D any different from something like Storm King's Thunder or Hoard of the Dragon Queen? In the Slave Lord series in particular, A3 "forces" the DM to capture the PCs because the A4 module starts out with the PCs as captives of the Slave Lords. And some early TSR adventures or sets of adventures, did have their "railroad" elements. After all, you were sort of expected to go from G1 to G2 to G3 of those Giant Modules (though, I would argue that you still had much more freedom within the modules, and that "railroading" in general was not present to anywhere near the extent that it is now). The last clause covers an important point. I would also say there's a difference between railroading the party into an adventure - going from Scourge of the Slave Lords A3 to A4, where you must contrive to have the player-characters captured so that they can be thrown into a cave complex - and railroading them once they're there. But there's no question that the adventure path thing, or whatever you want to call it, started early. And, no, I'm not claiming that that, in and of itself is wrong or evil. I greatly enjoyed the Slavelords series. It's more about a comparison between *any* pre-published scenario versus one that is home brewed... or an adventure module that is short in scope/length versus one that covers a broad swath of class levels (B2 versus Night Below, for example). No. It's not about published versus home brew. That has nothing to do with it. Published adventures can be, and often are, unplanned. Consider the first D&D adventures previously mentioned, or the contemporary Stonehell Dungeon (2009) by Michael Curtis, Barrowmaze by Greg Gillespie (2012) or Dwimmermount (2014) by James Maliszewki, Alexander Macris, and Tavis Allison. And home brew adventures can be planned (though, they are perhaps less likely to be so because many people don't like dreaming up and writing up all that complicated plot stuff). In terms of adventures that are short/long in scope, the unplanned Stonehell can potentially "take you through" 10th level (the "you" refers to you, the player, as it's likely that many player characters will die). The unplanned vs. planned thing is not about length or scope. Well, I would argue that if a DM has time to wade through 900 pages of 5th edition core book rules (!!! ), he probably has time to draw a map and put some monsters and treasure in it. But more importantly and to the point, I'm not against buying pre-made adventures. Indeed, personally, I'm in favor it. I bought Stonehell for the equivalent of a few hours of work at minimum wage, and now I can play it for, literally, years. I think that's a great deal. So a wide ranging adventure with some sandbox elements to customize like SKT [Storm King's Thunder] is a relatively treat. To criticize these kinds of modules as treating the players like puppets is entirely misdirected. Fair enough, but I think my analysis was more nuanced than that. I said that a) I sometimes like such adventures, b) they have their place, and c) they still allow a fair amount of room for player agency. I used "puppets" to bluntly frame the general issue. See my original post, especially the discussion of "points" 3 & 4. And I suppose it is true that detailed planned adventures can be a "treat" in that I can't imagine anyone coming up with that sort of thing, in such detail, on their own. That's not a criticism. No published adventure can give a player 100% agency, no matter how short. Even B2 goes with the assumption that the players will get to the "boss fight" with the cultists. See above. But also, having a "big boss" at, say, the bottom or end of the dungeon and, thus, anticipating that the players will probably eventually fight him, is completely different from choreographing how they are going to get there. See the excerpt from the Guidebook above. Your premise is entirely flawed because you seem to connect this to mechanics (specifically when you call out 4th edition) when it has absolutely nothing to do with mechanics or edition and everything to do with the limits of adventure design when trying to provide a long running campaign to DMs in published form. This brings up a more complex issue that I don't want to spend a lot of time on here. But briefly, when I speak of an edition, I mean at least three things - a) the mechanics, b) the explanations, guidance or philosophy expressed in the text of the rule books and c) the associated products, such as adventures, marketed with it. Among other things, looking at b), 5th edition, which is supposedly a partial return to D&D's roots, the current Dungeon Master's Guide contains many pages of advice on how to create drama and suspense through careful plotting of your adventure etc., etc. (so here's the core book telling you how to home brew a planned scenario). There is nothing like this in the three little brown books, Holmes. Moldvay/Cook (I don't think) or AD&D. The whole argument just falls flat when you turn it into some kind of OSR vs new school rant, when it has absolutely nothing to do with that. Well, to summarize, at some point this arguably just becomes silly semantics. But if the terms have any meaning (which I assume Owlbear believes or else he wouldn't be using them), I think it's a commonplace in the OSR blogosphere that one of the things that "old school" means is putting a emphasis on unplanned sandbox or dungeon/megadungeon settings, as opposed to preplanned plots or stories. I just don't think one can deny that - that most OSR blogger people believe it, and partly understand the term in that manner, regardless of whether they "should." And I think if most people use a label, even if arbitrary (which most labels in a sense are), it sort of ceases to be arbitrary, if that makes sense. But I have also tried to show that this is not simply arbitrary or a misunderstanding or whatever, but well grounded in the actual early history of D&D. Now, obviously, one can be a new school person who likes some old school elements, or an old school person who likes some new school elements, or a mix of both, or just one or the other, or whatever. And/or, if one simply doesn't like any of the labels - perhaps because of annoying associations, etc. - one can just dump them entirely. There's no law against that. But I don't think one can as easily ignore the history. Or rather, one can ignore it, but what's the point of that?. Tim Kask's 2nd Game of D&D - "I'm a lord! Wow, this is too cool!" It's so easy to forget how - before anyone knew what a "roleplaying" game was, before video games, before Star Wars or modern fantasy or science fiction movies - one's first experience playing Dungeons & Dragons could be so mind blowing. Here's Tim Kask describing his second game of D&D, played just a few minutes after his first. 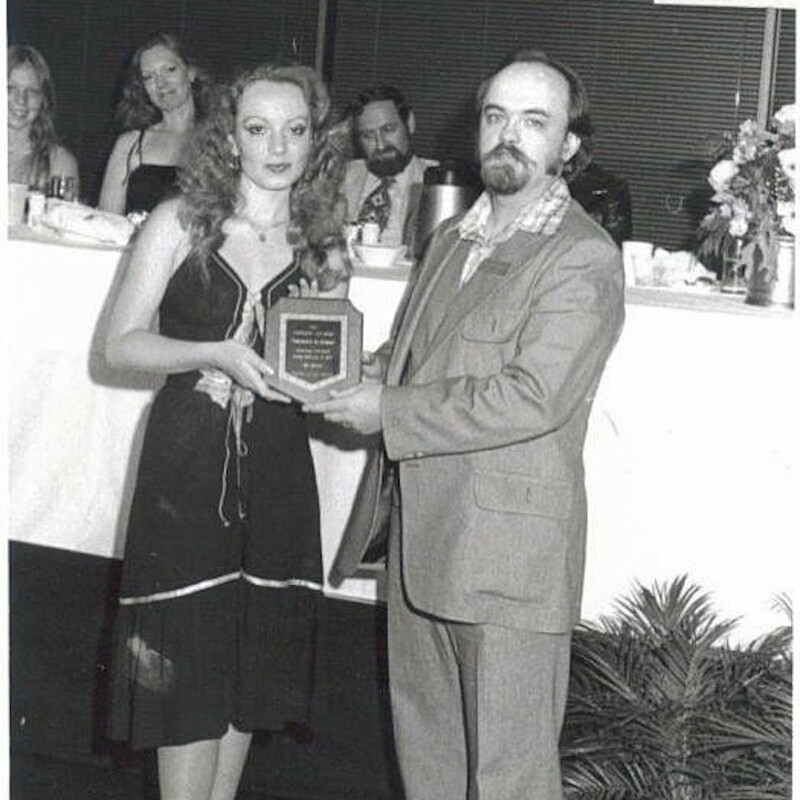 (This was on the last evening - I think - of the 1974 Gen Con.) Recall that in his first game, the entire party, including a sort of clueless Kask, had been carved up by a laser machine into paperweights. 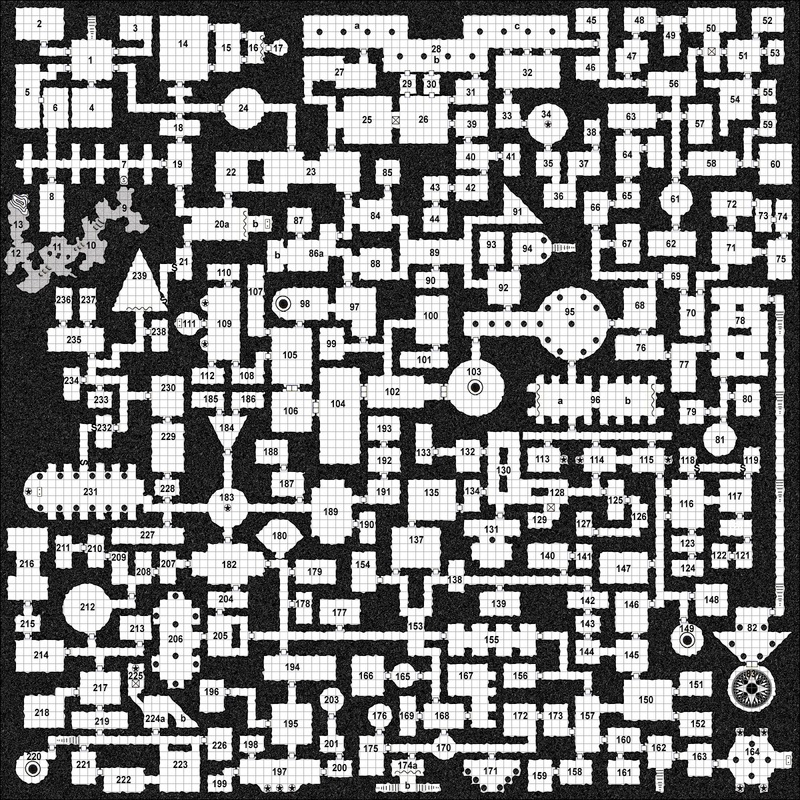 Joseph Bloch reminds us that this was probably the infamous Machine Level of Gary Gygax's Castle Greyhawk. Bloch's excellent homage to that megadungeon, Castle of the Mad Archmage, can be found here. The entire Grognard Games interview with Kask may be viewed on YouTube. Note the end of the interview, where Kask describes how, after his first experience with D&D, he then decided to buy the game and infect his friends with it. I always thought of the early game as being spread by what I like to call, evangelization. But perhaps infection is at least as appropriate a metaphor . . .
Grognard: Did you enjoy that first game or was it just a case of . . .
Tim Kask: I really didn't have any idea what had happened because I couldn't hear half the time. You know, we're in a large hall, and there's games going on all over, and there's movies going on, out in the in the garden area in the center, and I just kept missing snatches of the conversation. So, all right, what the heck . . .
Grognard: Your very next game was with Ron Kuntz who was shouting for volunteers . . .
Tim Kask: I think it was. I believe it was. I'm still sitting there scratching my head, and I'm not ready to leave yet. So a young man comes through, getting players together again. And I said, well, okay. I looked at my watch. I got time - that last one didn't take very long. So I, okay, I signed up. And this time, I was a dwarf. And I liked that idea. And I had an axe, and I was wearing chain mail. and I had a shield and a helmet. And I'm I'm getting into it now, and I'm up in the front - all right let's do it! you know? So, I'm just telling him what I do. And, of course, none of us had dice so he's doing all the dice rolling and everything. And I'm just, "I'm chopping at em!" And in the course of about, I don't know, maybe two hours that adventure lasted, we rescued a dying dwarven duke or something. And, as I was the only dwarf in the party, he gave me this, like, medallion of office. Now, all I had to do is go find his duchy or dukedom. And I had a hundred fighting men at my disposal. And I had a castle underground (you know, of course, he's a dwarf). And this was the . . . this was like hitting the jackpot, because the whole point of D&D was to adventure up to get enough money to build yourself a keep, go out and carve yourself a kingdom out of the wilderness, build yourself a keep and rule it as a lord. Ha! Second game, I'm a lord! Wow, this is too cool! So I went back and I bought the game. I bought a box - I bought the box, the little brown box. And I bought a set of dice. And I took them back, and I infected my game group at college, several weeks later. So that's how I started. It actually tracks my own first experience of Dungeons & Dragons - being a quasi-anonymous and unimportant character in a large group, and having absolutely no idea what was going on. I expect others have similar memories. Is this how you first experienced the game? Tim Kask was one of the most important figures in early D&D. 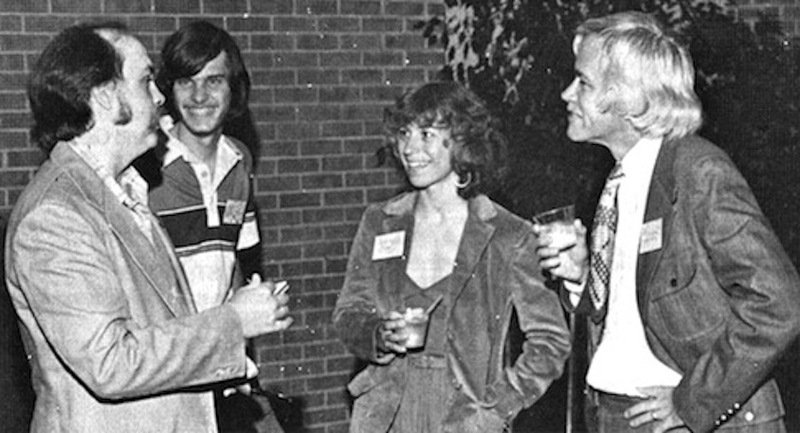 As an undergraduate at the University of Illinois, a chance phone call had earned him the friendship of Gary Gygax. And shortly after the events of the following story, he would be hired by Gygax at Tactical Studies Rules (the name of the company was in the process of being changed to "TSR"). Among other things, Kask would edit The Dragon magazine for a number of years. 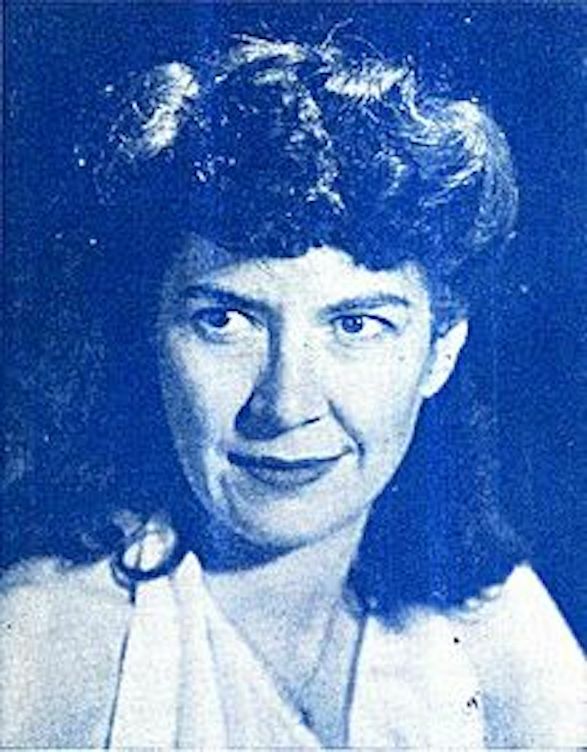 It may be that Kask's account is told or related elsewhere. But I had never heard it. It is part of a Google+ Hangout interview that Grognard Games did with Tim Kask on February 15, 2013, and that is now available on YouTube. I highly recommend watching or listening to the full conversation. Grognard: Your first ever game of D&D was at Gen Con. Was it 74? Grognard: 1974. Can you take me through that game, that day. And can you take us through your first game, and then the second game that you had that day? Tim Kask: Okay, well, I was there because Gary (Gary Gygax) had told us about this get-together at the time. I think he said, man, there's a couple, three hundred of us. Well my biggest gathering of gamers had been my club, which is about 20 strong, and so, I gotta go, I gotta go see 300 gamers in one place, yeah. And so, he'd been telling me all along about this new game he was working on, because I met him through the context of Chainmail. But he'd been telling me about this new game he was working out. And so I had the rudiments in my head, and naively I thought I'd find a hotel when I got there, and I realized I didn't. So I'm gonna game until I drop, and then I gotta drive four and a half hours. Oh, I figured I would just drive with my head out the window to keep me awake after all, it's gaming (laughs). Yeah, and so somebody's walking down - it was later in the evening, it's already dark - I remember that somebody was walking down one of the hallways at the Horticultural Hall saying we need some players, need some players. And I said, oh that's that thing Gary was talking about. I've been playing miniatures all day. And so I said, okay, sure I'll go. And I raised my hand. So okay (the man says), here, you're a fighter, and you got a sword and shield. You know, I'm, okay, cool, this sounds good, you know. And it was about six or seven of us, I guess, and so I got stuck in the back. And they said, watch the back. So that's all I did. Ok, I'm watching the back, and I'd tell them every once while, I'm looking behind us. And I don't know why, but apparently while I was looking behind us, something happened up in front of us, because the next thing I know - and I really don't know what's been going on because I'm also literally sitting in the back of three rows of chairs not catching everything - all of a sudden I find we're encased in some enormous block of gas permeable lucite of some sort, because we're not suffocating but we're completely . . . we can't even blink, we're so immobile. And I'm just sitting in the back, going, wow what just happened, you know. Yeah, I've completely bewildered and befuddled. And so we're dragged before this enormous bank of what must have been lights and dials and knobs and levers and whatever. And it didn't go well, because - again, I couldn't hear what was going on - but it was announced that we had all been cut up with laser beams into 1-inch cubes and made into paper weights. And I just . . . And this is like 35-40 minutes into the thing, and I'm going, well, that was certainly different than anything I've ever done before . . .
Next: Tim Kask's second D&D game.